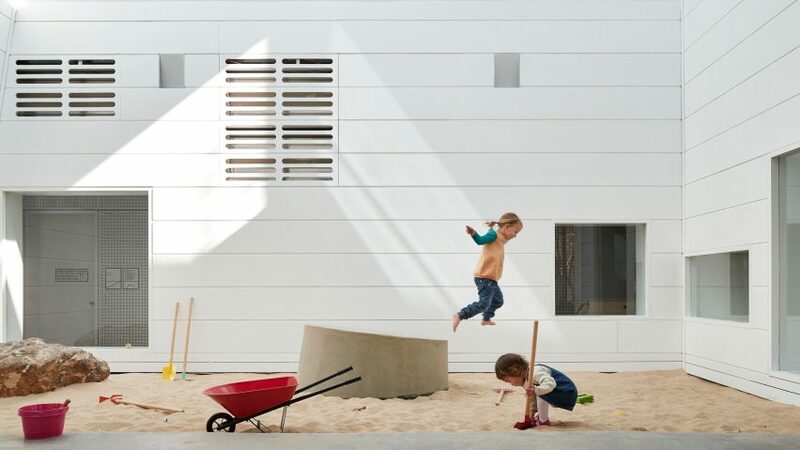 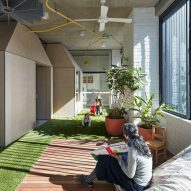 This Sydney childcare and community centre by Andrew Burges Architects is filled with tiny house-shaped rooms and has a sandpit on its roof. 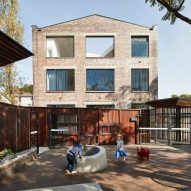 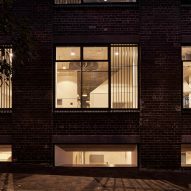 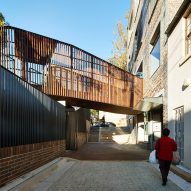 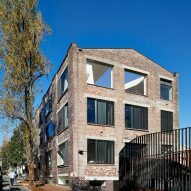 Conceived as a city at child's scale, the East Sydney Learning Centre is housed in a four-storey former warehouse building from the 1920s that is nestled within a tight network of lanes and streets. 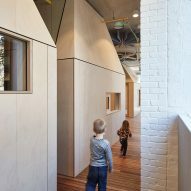 The architects were asked to convert the building to create a multi-level childcare centre with a community space on the uppermost floor. 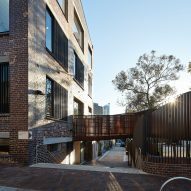 To create a unified link between the learning centre and its neighbouring playground, the brief also called for the closure of Berwick Lane – a thoroughfare that runs between the two sites. 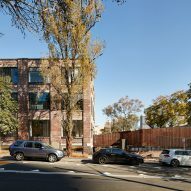 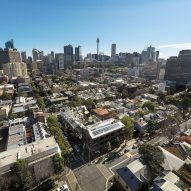 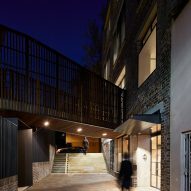 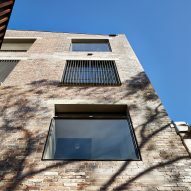 However, following extensive urban studies and community consultation, "a more imaginative urban design solution was developed," explained the Sydney-based studio. 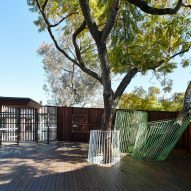 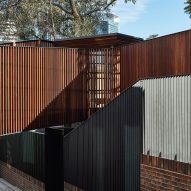 Instead of closing Berwick Lane to the public, a tree house bridge clad with vertical wooden slats was installed above the lane, connecting the school building directly with the playground. 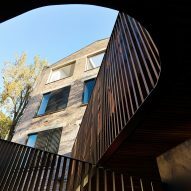 The lane remains open to the public and has been updated with a generous new sandstone stair. 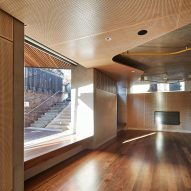 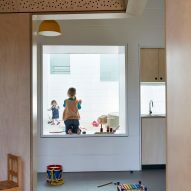 Inside the building, the architects drew inspiration from "the tight-knit urban texture of the inner city", reimagining the interior as a mini city at a child's scale. 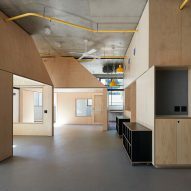 A series of plywood house-shaped enclosures on each floor function as quiet zones, skylights and ventilation stacks. 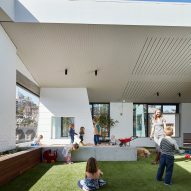 Referred to by the architects as "mini-city buildings", some of the house-shaped structures occupy just one floor, while others span across two levels to create double-height light-filled play spaces with sloping walls. 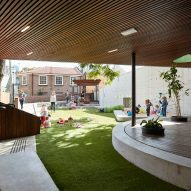 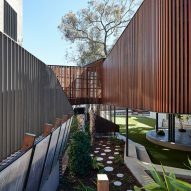 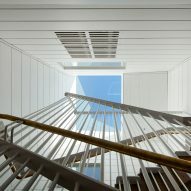 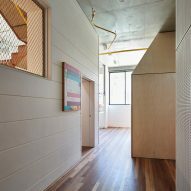 Pathways through the building were designed as streets and laneways, gardens as recreational space, and the bright yellow pipes that snake across the ceiling as infrastructure. 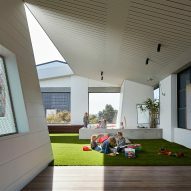 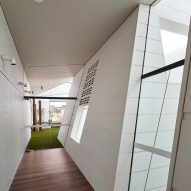 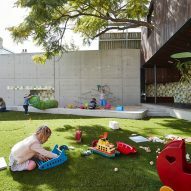 On the building's top floor, a sandpit surrounded by astro turf functions as a central plaza that is open to the sky. 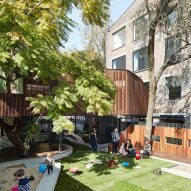 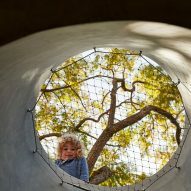 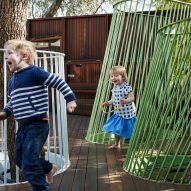 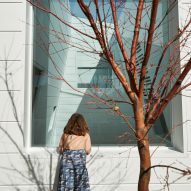 The architects specified natural materials and plenty of planting to create an engaging environment for the children, while the centre's building block-inspired signage was designed by Australian design studio Toko. 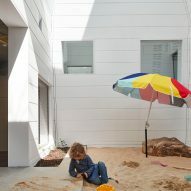 Other imaginative learning centres include Nomade Architectes' village-inspired nursery near Paris, which is covered in brown ceramic shingles, and a nursery near Mount Fuji with a curving timber roof.